I have so many spring-themed cupcakes I want to make this week, but these cookies were way too cute to pass up. 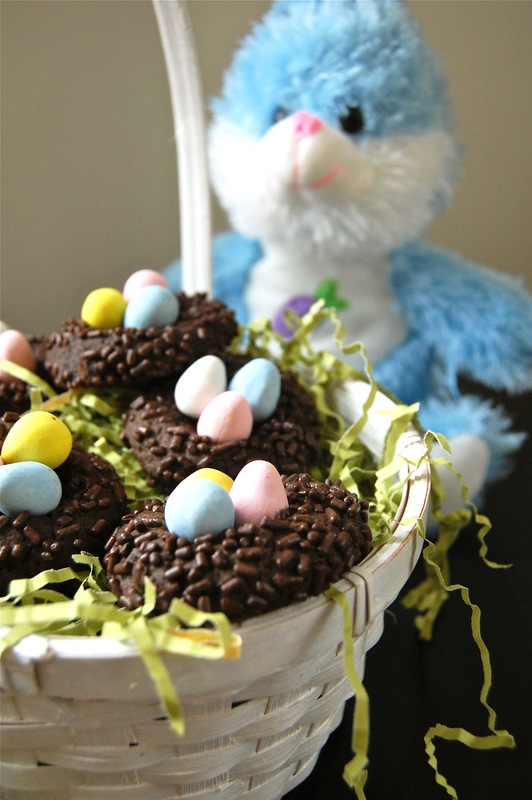 I decided to make these first since I had all of the ingredients on hand, and they required very little time and dishes...perfect when you need a last minute special treat for Easter. And what I liked most about these cookies (besides the fact that they are adorable) is that they highlight my favorite Easter candy...mini Cadbury eggs. It's a good thing I can only find them in stores once a year because my husband and I are both addicted to them. If you can't find them, then peanut M&M's will also work. I'm still going to make cupcakes, but I might just have to make another batch of these for Easter. Preheat the oven to 375°. Line two baking sheets with parchment paper. In the bowl of an electric mixer fitted with a paddle attachment, beat the butter on medium-high for 30 seconds. Beat in the sugar, cocoa powder, espresso powder, baking soda, and salt until well combined. Scrape down the sides of the bowl with a spatula as necessary. Beat in the egg and vanilla. With the mixer on low, slowly add in the flour. Mix until just combined. Roll the dough into 1 inch balls. Roll each ball in sprinkles to coat. Place on the prepared baking sheet, about 2 inches apart. Using your thumb, make an indentation in the center of each cookie. Bake for 7-8 minutes or until set. Remove from the oven and allow to cool slightly. Use your thumb to re-make an indentation, if necessary. Gently press three mini Cadbury eggs into the center of each cookie. Transfer to a wire rack to cool completely.